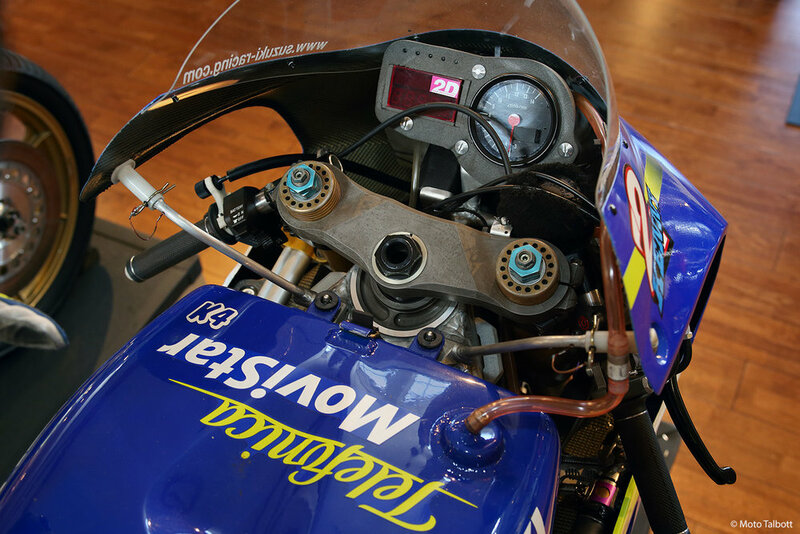 The Moto Talbott museum recently put another iconic racebike on display: the two-stroke Telefonica MoviStar Suzuki RGV500 that Kenny Roberts Jr. used to win the 500cc World Championship in 2000. That year, Roberts earned four wins and five podiums--enough to fend off a challenge from an up-and-coming 250 rider by the name of Valentino Rossi. In doing so, Roberts became the first son of a world champ to win the title. Sharp-eyed visitors will notice that the No. 1 on the front of the fairing has been crudely pasted over the No. 2. Roberts displayed until the penultimate race. Roberts’ race leathers are also on display. The Suzuki came with explicit instructions from KRJR himself: don’t clean or dust the bike! He wants it just as he rode it back then. Museum founder Robb Talbott has struck up a friendship with Kenny Roberts Sr. “He likes to give us bikes to display,” says Robb. “But we don’t have much warning—they just show up on the back of a truck!” Nice problem to have—and we’re proud to display them. The Suzuki sits next to two other world championship race bikes: one of the two-stroke YZR500s that Roberts Sr. rode to his GP championships ('78-'80); and Wayne Rainey’s Yamaha YZR500 OWC1 .